KKBOX is a Taiwan-based content streaming and analysis service with more than 400 employees. KKBOX started operations in 1999 by focusing on mobile value-add service and personal computer tools, but by 2004 had pivoted to become a streaming music business due to the shift toward the digital music market and the lack of video streaming avenues in Taiwan. KKBOX now provides one of the largest music streaming services in Asia-Pacific, with customers in Hong Kong, Japan, Malaysia, Taiwan, Thailand, and Singapore. KKBOX started operations by running applications and services—including music streaming and big-data analytics—on servers, storage, networking, and associated systems in a hosted data center. The big-data analytics tool was critical to KKBOX’s success. By measuring user behavior such as the type of music selected most frequently, the business could determine the songs that would be most popular with its audiences and focus marketing and promotional activities accordingly. To allow the business to respond quickly to fast-changing musical tastes and trends, the KKBOX analytics team had to deliver reports in a timely fashion. However, the hosted infrastructure model could not support this critical requirement. “We would need up to 50 servers to run a parallel Hadoop cluster to analyze user data,” says Eric Tsai, chief technology officer at KKBOX. “It took us up to two months to purchase and install the hardware and software to complete this analysis, compromising our ability to respond quickly to changes in customer trends.” Once KKBOX acquired the server resources needed to complete analytics, business teams would still have to wait up to two weeks to receive reports that could be used to refine the streaming music service. This length of time potentially exposed the KKBOX business to competition from more agile global players in the same industry. Within two years of resolving its analytics issues by migrating the software to an Amazon Web Services (AWS) architecture, KKBOX faced another sizable infrastructure development project. KKBOX owner, KDDI Corporation, wanted to re-architect a video-on-demand streaming service, initially developed in an on-premises architecture in partnership with a European service provider. The model involves KKBOX collaborating with KDDI to act as a service provider to organizations that wanted to stream videos live or on demand. Despite securing more than one million subscribers, the service was not meeting KDDI’s stringent requirements around performance and availability. These problems threatened to impede the proposed launch of a project involving the delivery of a KKBOX-branded video service—also running in AWS—to countries across the Asia-Pacific region. In 2011, KKBOX conducted an evaluation of competing cloud services and selected AWS to run its analytics software. 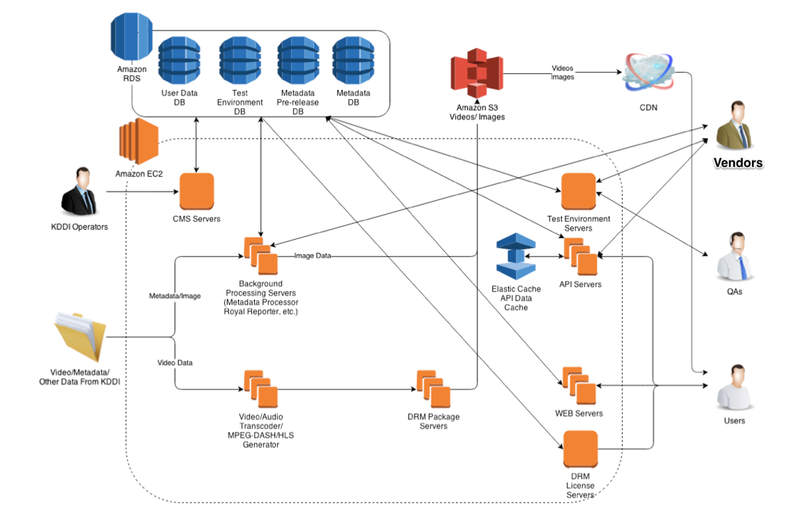 KKBOX discovered it could leverage Amazon Elastic MapReduce (Amazon EMR) to deliver a managed Hadoop framework to distribute and process user data across hundreds of Amazon Elastic Compute Cloud (Amazon EC2) instances that could deliver resizable compute capacity. Other advantages could be obtained with the Amazon Virtual Private Cloud (Amazon VPC), which enables users to isolate sensitive back-end systems from the Internet and take advantage of multiple security layers including security groups and network access control lists. “With AWS, we did not have to create infrastructure features from scratch, and the speed at which their technical teams were developing and launching new services was quite astonishing,” says Tsai. “Further, AWS was acknowledged as number one in the cloud services marketplace by analysts and observers.” The willingness of AWS to share detailed technical information about its services and architectures also won over some technical team members at KKBOX, who had a more traditional view of infrastructure options. Following a smooth migration process to an AWS architecture, the KKBOX data analytics software was meeting all performance and availability requirements. The migration was planned in several stages, including data center migration, Android application migration, iOS application migration, and eventually the enforced all application upgrading. This outcome gave KKBOX the confidence to launch the redeveloped video streaming platform in an AWS environment. KKBOX launched the first stage of the platform on AWS in July 2015, and the second stage—supporting animated video—to AWS in November 2015. KKBOX is also running smaller systems on AWS including an online service used to sell tickets to concerts, theater performances, and other events in Taiwan. KKBOX now uses Amazon EC2 to provide compute resources for the re-architected video streaming service, with Elastic Load Balancing distributing incoming API requests and streamlined log feeding across multiple Amazon EC2 instances. Amazon Route 53 provides domain name system services while Amazon Simple Workflow Service (Amazon SWF) delivers the workflow engine for the service. Amazon Simple Storage Service (Amazon S3) stores all raw video before it is transcoded into the desired formats, mostly adaptive streaming formats, including MPEG-DASH, HLS, and MSS. Amazon Simple Email Service (Amazon SES) enables KKBOX to email its customers to promote new services or advise when a particular service is unavailable due to a technical issue. Amazon CloudWatch is used to provide monitoring and alerts when infrastructure problems such as sub-optimal performance arise. The company plans to move to more complex products such as AWS Lambda to run code in response to events and automatically manage the underlying compute resources. KKBOX is using AWS Support to address any technical concerns and Tsai is extremely pleased with the outcomes. “Our stakeholders wanted to ensure any issues were dealt with immediately and that we could grow our infrastructure quickly in line with the business,” he says. When KKBOX elected to establish the second version of its video streaming platform on AWS, the business used an AWS Support feature called AWS Infrastructure Event Management to review its proposed architecture before, during, and after the event. This included an AWS on-site support engineer working with the KKBOX technical team to monitor and assist with the migration process. “By leveraging AWS Infrastructure Event Management and our Enterprise support plan, we were able to migrate one million users to the second version of the platform smoothly and without any downtime,” Tsai says. The AWS Infrastructure Event Management service also incorporated a post-project meeting between KKBOX and AWS to identify lessons to be acted upon during the next major migration or development. The positive outcomes extend to the video streaming service. “Running our re-architected video streaming service in AWS rather than on a physical infrastructure is saving KKBOX up to 50 percent in video encoding costs thanks to scalable Amazon EC2 and Amazon S3,” says Tsai. In addition, the analysis team can also access infrastructure resources that support the transcoding of thousands of high-definition videos for clients per day. While the business has not yet calculated the availability and performance levels it is achieving from the AWS infrastructure for its video platform or its big-data analysis service, Tsai is convinced KKBOX is achieving significant improvements over its previous infrastructure. Tsai is extremely pleased with the new features and innovations AWS delivers. “We are now looking at migrating our core music streaming service to an AWS architecture. We are also examining the options for reducing our costs, and improving our availability and performance with AWS,” he says. Learn more about how AWS can help your big data, analytics and business intelligence needs.